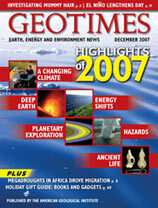 In 2007, the earth sciences got the media’s attention. You could hardly find a newscast, newspaper or magazine that wasn’t talking about climate change, weird weather patterns, energy or the latest finding from Mars. Seemingly no matter the subject, it became readily apparent how interconnected these issues are — so that’s the focus of the Highlights issue: the story of climate and energy, climate and hazards, hazards and deep Earth, energy and space, and of course, the story of us and our past, in the form of new looks at what ancient DNA can tell us. What do you think was the biggest earth science news story of 2007? Loma Prieta not from a weak fault? Should we or shouldn’t we try to develop strategies to enhance societal resilience to climate change? That is the question. In August, Americans were transfixed by the coal mining disaster in Utah. 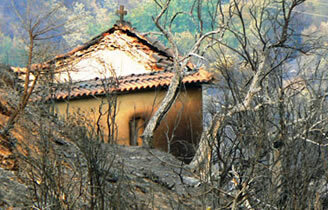 In the wake of the disaster, questions have been asked about mine safety and education. Background cover image is of the Ross Sea in Antarctica, by Mike Usher, courtesy of the National Science Foundation. Solar panel photo courtesy of DOE/NREL, credit — Beck Energy. Other individual images are credited in each story.